Fresh from announcing the end of its Classic line of phones earlier this week, BlackBerry has assured those accustomed to tactile feedback that its trademark full physical keyboard will live on. "In response to some recent press reports, I want to be clear that BlackBerry users have nothing to fear - the keyboard is here to stay" tweeted Alex Thurber, Senior Vice President for BlackBerry Global Device Sales. 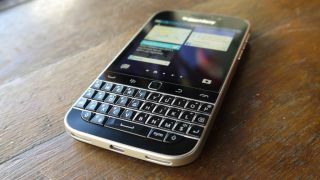 Discontinuing the BlackBerry Classic in order "to keep innovating and advancing [its] portfolio," murmurs arose of the company ditching physical keyboards altogether to produce more conventionally-designed smartphones. While the big rumor remains that BlackBerry is making three new Android-powered devices this year, one of the supposed designs still includes an old-school keyboard, supporting Thurber's comments. Additionally, currently-available devices like the BlackBerry Passport and the Priv also sport a keyboard, ensuring BlackBerry fans won't be left stranded following the retirement of the Classic. Will Apple take the keyboard out of its Macbooks?